Dimensions (HxWxD): 1.1" x .66" x 0.33"
This gorgeous museum quality 33+ carat Rainbow Moonstone bas-relief of the Egyptian Goddess Isis, Queen of Magic, Mother of Horus, Bride of Osiris, Mistress of the Dog Star, was carved with loving care from a single large highly luminous gemstone and set in a 22 karat gold bezel setting by Pedro, a world-renowned artist, jeweler and shamanic practitioner, who resides in Tokyo, Japan. The luminous rainbow chatoyancy is viewed from many angles to appreciate its mystery & rainbow flash! It appears to be quite different depending on the surface against which it is viewed. Its energy signature is one not only with the healing power of beauty, but with a very soothing and beneficent presence, assisting us to connect with our higher self, guides and teachers and our best intution. Pedro is a magical artisan from Mexico who creates Sacred Gemstone Art to wear & place on your altar. Pedro's work is in museums around the world. Pedro is a practitioner of Mystery School teachings of East & West including Shamanism, Sankhya Yoga, sacred geometry and the art & magic of working with sacred gemstones. Pedro's work is imbued with a deep beauty & powerful energy signature that makes each of his gemstone creations a valued collector's item and a Lightworker's power tool. Each gemstone is selected for its esoteric properties to resonate specifically with the Deity or Angel depicted. 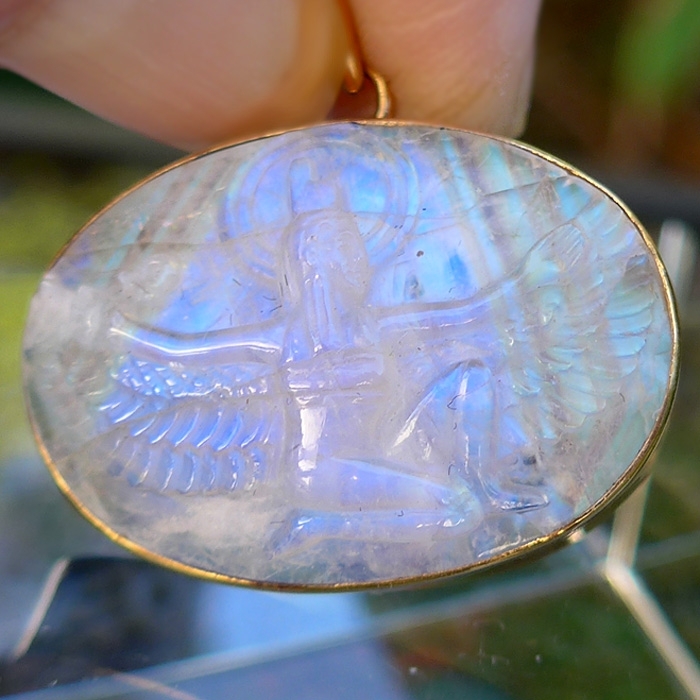 Pedro selected gemstone quality Moonstone for his gorgeous rendering of the Goddess Isis because the Moon is one symbol of Isis. As you can see in the photos on this page, this beautiful Moonstone pendant shimmers with color as you rotate it in space. The colors of Lady Isis are white, gold, and cobalt blue, all clearly visible in the colorful rays of refracted light shimmering off the surface of this gorgeous pendant. Many in the Middle East view these as the colors of royalty and comfort. The gemstones associated with Isis are pearl, coral, lapis, geodes, and moonstone. Wearing jewelry with these stones is a particularly effective way to bring the goddess near. Use the goddess fragrances of myrrh, rose, iris, and eucalyptus on your person, in your home or at your office to increase your resonance with the Lady Isis and increase your access to her energy of Divine Love. The posture of the figure on this Moonstone Lady Isis Pendant is familiar to all students of Egyptian art. As depicted on this Moonstone bas-relief, Lady Isis extends her wings in a gesture of protection, while on her knees, making an offering of the sacred ankh to the Divine. To the Egyptians the ankh was both a ritual object and a hieroglyph, part of their written language, a power-symbol whether written, spoken or fabricated. The ankh is also known as "the key of life", "the key of the Nile" and the "crux ansata", and the meaning of this Egyptian hieroglyph is "eternal life". This Lady Isis Moonstone pendant has a blue shimmering reflective sheen that gemologists call "blue adularescence." This means that the Moonstone shines with a spectral lustre that flashes blue in different lights, or as the gemstone is rotated in the line of sight. This gemmy Moonstone Isis pendant produces a wavy multi-colored band of light; like a cat's-eye, with rays ranging from orange to golden to electric blue and a preoponderance of violet. 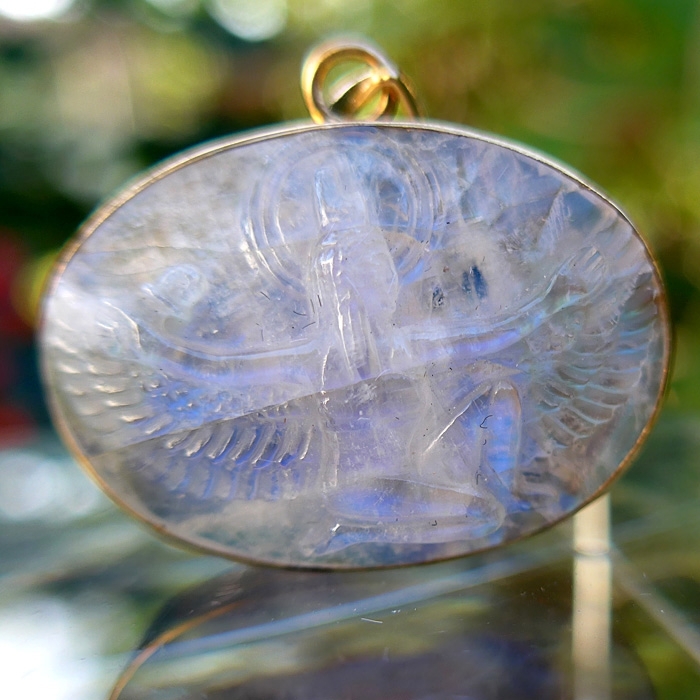 The gold and violet shimmer produced by this Moonstone Lady Isis pendant indicates this gemstone's resonance with the crown chakra, which is considered to be violet or gold in the Western chakra system. Gemstone quality Moonstone like this gorgeous Lady Isis Moonstone Pendant provides a feeling of energetic and emotional expansiveness, giving the bearer a developing feeling of the possibilities in life, the potential for accelerated spiritual growth and increased love and light -- and this expansive emotional state resolves into feelings of harmony and joy. Egyptian scriptures say: "In the beginning there was Isis, Oldest of the Old. She was the Goddess from whom all Becoming arose. Isis revealed the Mysteries of the Stars to the Eldest God, and birthed the Sun "when he rose upon the Earth for the first time." Yet although Isis was Oldest of the Old, she was said to have a mother, Nuit, the Goddess of the Night Sky. Like her Mother, Isis is known as a Star Goddess, identical to Sirius, a star sacred to many spiritual seekers both East and West since before the dawn of time-keeping. Isis has a dark twin sister, Nephthys, Goddess of the Underworld, a crone of the highest order. Thus Isis is virtually identical with Mother Nuith and Crone Nephthys. Isis is a Trinity of Goddesses, yet another historical example what scholars call theTriple Fold Goddess, Mother, Virgin (Daughter), and Crone, a mythic configuration that can be traced back at least as far as the Neolithic era. Sirius is also known as the Dog Star, and sits in the constellation of Canis Major. Canis means "dog" in Latin. The name Sirius is Latin, from the Greekseirios astÄ“r or "scorching star," because Sirius rose with the sun in the heat of summer. The heliacal rising of Sirius coincided with the initiation of the Nile river's flood stage every year, and worship of Isis on that day reached a high point as well. "Sirius is the one consecrated to Isis, for it brings the water," said the Roman philosopher Plutarch. "Contrary to other rivers, [the Nile] begins its annual swelling in the hottest time of the year, at the beginning of the dog Days," explains Lucy Lamie, in her book Egyptian Mysteries. "That is, at the moment when Sirius rises at the same time as the sun, a date which during the third millennium BC coincided with the summer solstice." The Goddess of the Waters of Life and Vegetation married Osiris, who was dismembered by a jealous rival, Set, who had married Nephthys. After many adventures, Isis resurrected Osiris, and had a son, Horus, God of the Sun, just as Osiris is God of the Sun. For the temple priests of the Egyptian dynasties, Osiris, the dying and reborn god, connected with the morning star Venus, which was known as “the heart of the renewed sun”. Lord of the Underworld and King of the Dead, in his role as the resurrected God, Osiris represented light, life and consciousness, the ever-renewing power of the Solar Disc. The cult of Isis and veneration of the Sky Goddess spread far beyond Egypt into Greece and Rome, and eventually throughout the Roman Empire. Over the centuries the worship of Isis and her husband Osiris was replaced by Christianity, and veneration of Mother Mary absorbed the cult of Isis, transforming both the original metaphysics and rituals of the Isis cult, and the metaphysics and history of Christianity at the same time. The seven pointed star, which derives from the heptagon, has a unique energy signature, which is related to the principles of sacred geometry. As we shall see, Isis is related to the Seven Pointed Star and her star is in fact, Sirius, the Source of Mystic Wisdom and the brightest Star visible from Earth. There is also a deeper significance to the geometry of the heptagon, as we shall see. In the Tarot deck, the seventeenth Trump, called The Star, reveals Isis, the Virgin-Mother Goddess, pouring forth her cosmic waters from the transcendent realm into the material Universe, where they manifest as the energy called Shakti, materializing as the Milky Way, the array of stars that illuminate and enliven the entirety of the natural realm. The nature of the Virgin Goddess is Total Unconditional Love, unconstrained by factors of time and space. The spiraling forms of liquid light being poured forth from her cups in the Tarot Trump called The Star represent the Universal Life Force Energy which creates and sustains all the forms of Nature we perceive in this Four Dimensional Universe. The Virgin Goddess transfers that energy from the Source of all Creation into this material world, and also returns that energy to Source when material manifestation of a particular, given form reaches an end-state. The energy of the star Sirius, and of Lady Isis, can be seen to be of the same frequency as the golden light referred to in Western mysticism as Christ Consciousness, the energy associated with the crown chakra. This Moonstone Isis pendant displays an amazing display of gold to orange to electric blue to violet, making this pendant ideal for healing and for meditation by those on the spiritual path, who seek to elevate their consciousness and unite with Higher Mind. Above all this pendant is ideal for those who wish to connect to the energy stream of the Divine Triple Fold Goddess manifest as Isis. Lovers could tell a million stories about the crazy chain of coincidences that brought them together in this life. The synchronicities that manifest in the outer world to bring the two lovers together are a reflection of the pure inner desire for Unconditional Love that burns in the hearts of the two aspirants. So whether you desire a pure and uplifting love relationship or accelerated spiritual development in your life, the Virgin Goddess will oversee your efforts and respond to your desire -- if it is pure and free of the "lust of result". In other words, you must be willing to accept the Design of the Universe, and in asking for the Grace of the Virgin Goddess, you must be willing to accept her Guidance, even if it lead you to Realms far removed from what you picture in your mind's eye as an answer to your prayers. 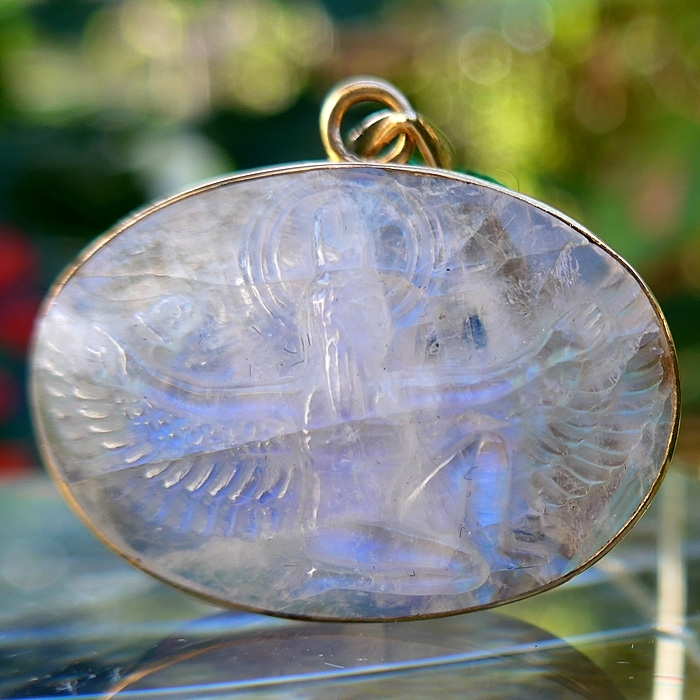 This Moonstone Goddess Isis Pendant is one conduit for Her Love and Light to reach the Earth. May that Love and Light be grounded within your Being and your Life. Above weight is shipping weight. Net weight is 8.5 grams or .3 ounce.